It's one of the basic tenets of online security: Never use the same password/username combo for every website that requires one. The logic is sound, of course. A single security breach could expose your most private information — such as banking and credit card numbers — to the bad guys. Problem is, who can remember multiple passwords and usernames? Many times I've signed up for a service, returned to the site a few weeks later, and quickly realized that I couldn't remember my login details. Google and other major online players, including AOL, Facebook, Microsoft Plaxo, MySpace, and Yahoo, are pitching a simpler alternative: A single password/username combo, such as your Google or Yahoo ID, for multiple sites. The concept, based on the industry standard OpenID 2.0 protocol isn't exactly new. In fact, Google announced over a year ago that it would support the single single-in plan. However, industry support appears tepid for OpenID, as many popular sites still don't accept an OpenID login. Perhaps that's why The Official Google Blog on Tuesday beat the OpenID drum, and gave a quick run-through of how the service might benefit Facebook and Plaxo users. As the Google Blog points out, this simplified sign-in eliminates a tedious, multistep process for Gmail users who join Plaxo. It's more secure too. 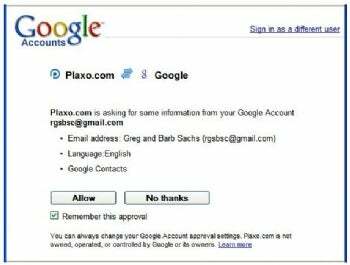 Verification (in this example) is handled by Google, so Plaxo never sees your username and password. "Since you don't have to enter your password on additional sites, your password remains closer to you and is less likely to be misused," writes Google security product manager Eric Sachs. OpenID is a great idea, but wider acceptance is needed for it to become truly useful. I suspect that Yahoo, Microsoft, and Google aren't truly comfortable with a single sign-in approach for their key properties. Today, for instance, I can't use my Yahoo ID to sign into my MSN account, nor can I use my Windows Live ID to enter Yahoo Mail. In the mean time, I better work on my memorization skills.